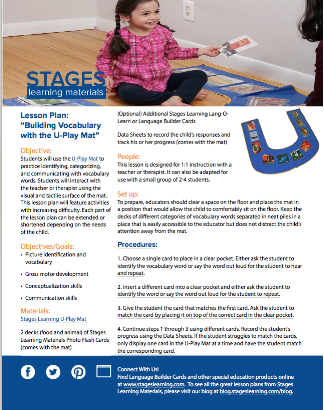 To prepare, educators should clear a space on the floor and place the mat in a position that would allow the child to comfortably sit on the floor. Keep the decks of different categories of vocabulary words separated in neat piles in a place that is easily accessible to the educator but does not distract the child’s attention away from the mat. Choose a single card to place in a clear pocket. Either ask the student to identify the vocabulary word or say the word out loud for the student to hear and repeat. Give the student the card that matches the first card. Ask the student to match the card by placing it on top of the correct card in the clear pocket. You can continue steps 1 and 2 using different cards. 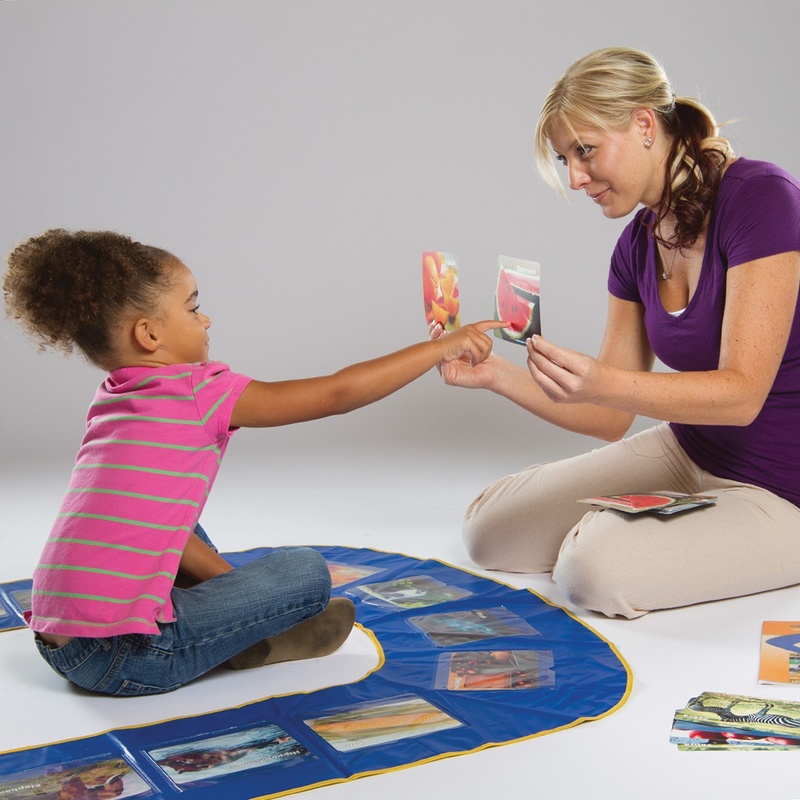 After the U-Play Mat is filled with cards the student has correctly matched, point to different cards and ask students to verbally identify the cards. Once the student has correctly identified the cards, ask the student to find a card with a certain characteristic. For example, students can find a card that includes the color green, has stripes, or is a breakfast food. Encourage the student to point to the card in addition to saying the image out loud. Pick up a card from the deck that matches one on the mat and don’t show the student what the card is. Describe the card and have the student try to guess which card you are holding. You can help the student identify the card through a process of elimination, taking out any cards that do not match your descriptions.